IMAGE: This is a Lunar Reconnaissance Orbiter Camera wide-angle color-shaded relief — orthographic projection centered at 240 degrees longitude and 0 degrees latitude. Credit: Source: NASA/GSFC/DLR/Arizona State University. Cover by the Geological Society of America. Boulder, Colorado, USA – Impact cratering is one of the most fundamental geological processes. On many planets, impact craters are the dominant geological landform. On Earth, erosion, plate tectonics, and volcanic resurfacing continually destroy the impact cratering record, but even here, the geological, biological, and environmental effects of impact cratering are apparent. Impact events are destructive and have been linked to at least one of the 'big five' mass extinctions over the past 540 million years. Intriguingly, impact craters can also have beneficial effects. Many impact craters are associated with economic metalliferous ore deposits and hydrocarbon reservoirs. This Special Paper from The Geological Society of America provides an up-to-date synthesis of impact cratering processes; the role of meteorite impacts in the origin of life, products, and effects; and the techniques used to study impact craters on Earth and other planetary bodies. 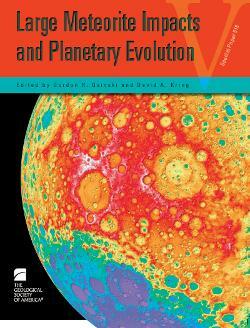 This volume, edited by Gordon R. Osinski and David A. Kring, is a result of the Large Meteorite Impacts and Planetary Evolution V conference held in Sudbury, Canada, in August 2013.